Spring is a great time to visit the big island of Hawaii. There’s never a shortage of things to do. Sun, sand, great food and friendly people make the island a vacationer’s paradise. Here at the Kilauea Hospitality Group, we offer three stunning accommodation options for those visiting the big island, ranging from basic to luxury. You can find our most basic rooms – suitable for solo travelers and backpackers – at our Volcano Hale location, while Lokahi Lodge offers larger rooms with private baths. Our luxury location is Chalet Kilauea where we offer rainforest-inspired rooms with daily housekeeping and complimentary wifi. Volcano Hale. Just a short drive from our hotel office, the lodge rooms at Volcano Hale are some of the best valued in the Hawaiian Islands. These rooms are nestled in a pristine rainforest. Just 5 minutes from the entrance to Volcanoes National Park, Volcano Hale features 5 clean bedrooms and 2 shared bathrooms – perfect for budget travelers, adventure seekers, and backpackers. All guests have access to a community kitchen, free wireless internet and beautiful rainforest views! Lokahi Lodge. Our Lokahi Lodge rooms combine luxury and affordability. Also tucked into the pristine rainforest, Lokahi Lodge features 5 Standard Hotel Rooms. These vacation rentals include private bathrooms, daily housekeeping, beautiful rainforest views and free wireless internet. The property’s amenities include a 6-person hot tub as well as free coffee and tea. Chalet Kilauea Hotel. Chalet Kilauea Hotel is our luxury property that features beautifully designed rooms – some stand-alone bungalows – inspired by the nearby rainforest. These luxury accommodations feature private baths, daily housekeeping and free wireless internet. 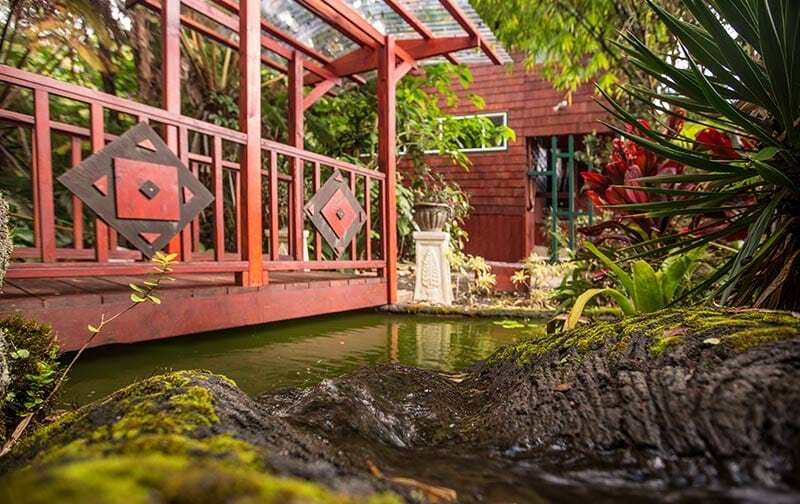 The property’s amenities include a garden gazebo, koi pond and a 6-person hot tub. Free coffee and tea are always available when the hotel office is open. Kilauea Hospitality Group properties are located in the last bits of virgin Hawaiian rainforest (only roughly 10% is still intact). Since our inception, we have employed ecologically friendly solutions in order to preserve, cherish, and respect one of the great remaining Hawaiian treasures. Ready to book your spring vacation on the big island? Visit our reservations page to book your room today!